After an unsuccessful nighttime leaf-tailed gecko hunt in the rainforest, I was returning to my room at O'Reilly's when I noticed a suspicious dark spot on the side of the building I was walking along. My flashlight revealed this juvenile gecko hunting gecko snacks. Against a tree, this gecko would be very hard to spot, but on the plain-colored wall, it stood out distinctly. 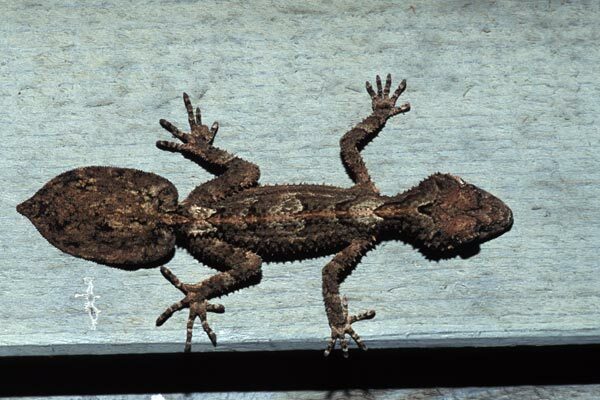 Until recently, this species was known as the southern population of the Northern Leaf-tailed Gecko, Phyllurus cornutum. Thanks to Australian ecologist Mark Sanders for informing me of the recent reclassification.